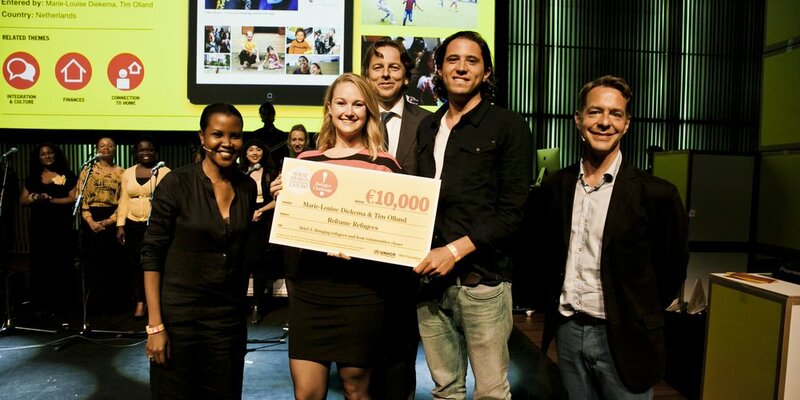 That's me (on the left) distributing checks to winners of the Global Refugee Design Challenge. Winners were given checks to accelerate their winning ideas for solving complex refugee challenges. I’m a Fulbright Scholar who works at the forefront of the UN Refugee Agency (UNHCR) innovation program. As a core member of UNHCR’s Innovation Unit, I drive strategies to engage staff and refugees in open innovation. The best part of my job is working in the field on programs that foster bottom-up innovation among displaced populations. But, I feel that true impact will come from connecting local innovators to capital and financing. And so now I’m seeking a career in social impact investing and humanitarian financing. Before joining the UN, I worked in South Africa, traveling around townships in Johannesburg and Cape Town, giving micro-entrepreneurial training and mentorship to asylum-seekers. My passion for social enterprise/innovation started in grad school at Carnegie Mellon University’s Heinz College of Public Policy and Management. My team’s capstone project led to the creation of a tool that could calculate the return on US government investment in social innovation. In January I'll receive a professional certificate in Social Impact Investing & Social Enterprise Management, after which I hope to be able to accelerate and scale community-owned innovations with the potential for large-scale social impact through new approaches to financing in the humanitarian sector.